Being a denizen of the City of Pasig, I'm always looking for places within the area where I can grab a bite. One of my go-to places is The Grove by Rockwell, which has one of my favorite Ramen places, Hanamaruken, and Sunrise Buckets. For the longest time, these were the two restaurants that I would associate The Grove with, not realizing that over the past year, more and more restaurants have sprouted at their complex, making the place a virtual food lover's paradise. 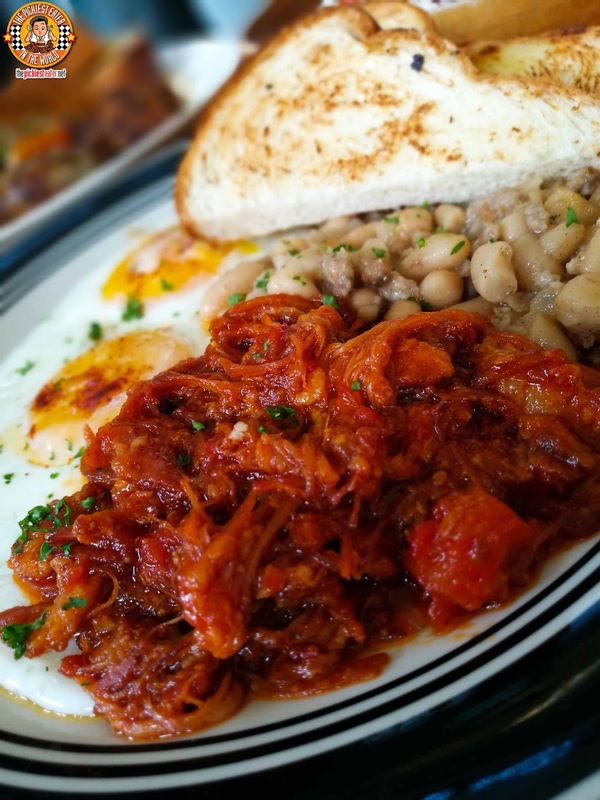 I joined a few of my foodie friends for a day of exploring The Grove, and we started with one of my favorite restaurants, that opened a new branch there last year.. Pi: Breakfast and Pies! Pi: Breakfast and Pies is the brainchild of Chef Ed Bugia, of Pino fame. 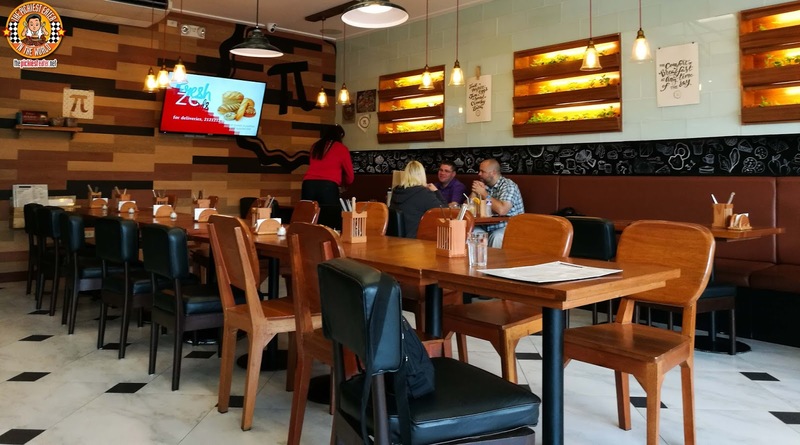 After the smashing success of the Quezon City branch, he opened his second outlet sometime in 2016. If you've been to the branch at Teacher's Village, you'll be relieved to know that this branch is more spacious and offers a brighter atmosphere. It still has the rustic tones that gives you a contemporary country vibe, that you feel right at home in as you enjoy their all day breakfast menu. I think it's physically impossible for Rina to visit Pi without ordering their. 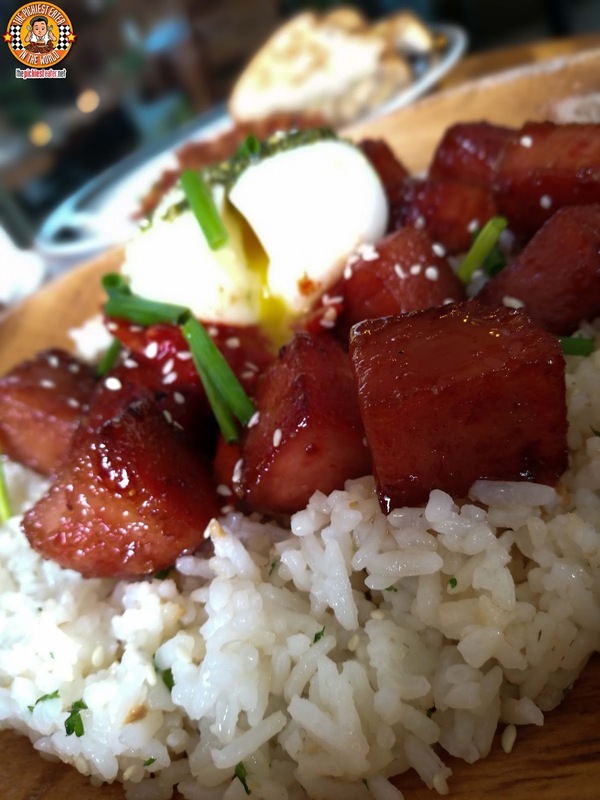 Caramelized Spam (P265). There's something truly comforting about that classic canned luncheon meat, but Chef Ed took it to another level by creating a caramelized glaze around it, and pairing it with a menagerie of components that you wouldn't expect to work together, yet playfully plays off each other's flavor profiles. The sweetness of the Spam is tempered by the creaminess of the egg, while a dollop of Kimchi makes sure that the egg never becomes too rich, and a touch of pesto offers a nice earthiness, giving a nice contrast to the tartness of the Kimchi. I'm not a fan of canned Pork and Beans, but Pi's version of Pork & Beans (P295) is once again, next level kind of breakfast food. The Pork is question is , Slow-cooked Bacon Slab, that is slathered in Chef Ed's homemade BBQ sauce, adding a whole new level of tanginess to the meat. The pork is tehn served with Stewed White Beans, and Fresh-Baked Brioche Toast, and Two Sunny SIde Up Eggs. For big breakfast eaters, The Big Breakfast Platter (P595), is more than enough to keep you satisfied. 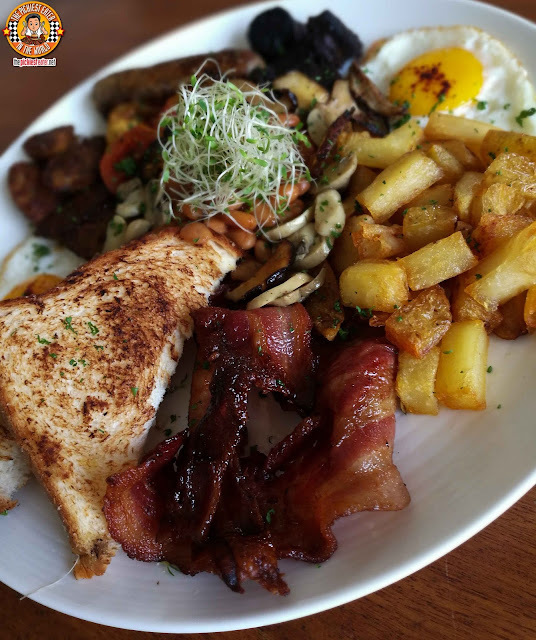 Featuring strips of Pi's homemade bacon, a trio of sausages, (including Hungarian, Italian and Chef Ed's Pinoy take on "Blood Sausage", the dinuguan sausages), a pair of sunny side-up eggs, some of the best country fried potatoes you'll ever have, a medley of roasted mushrooms, pork & beans, and a roasted tomatoes. I could probably have polished off this entire all by myself, with the exception of the tomato and the dinuguan sausage. Cuz you know.. That would have been too much. As you would expect, Pi Breakfast and Pies has an eclectic selection of Pies to choose from. I've said it time and again, I'm more of a pie guy than a cake guy, so this was like heaven on Earth for me. 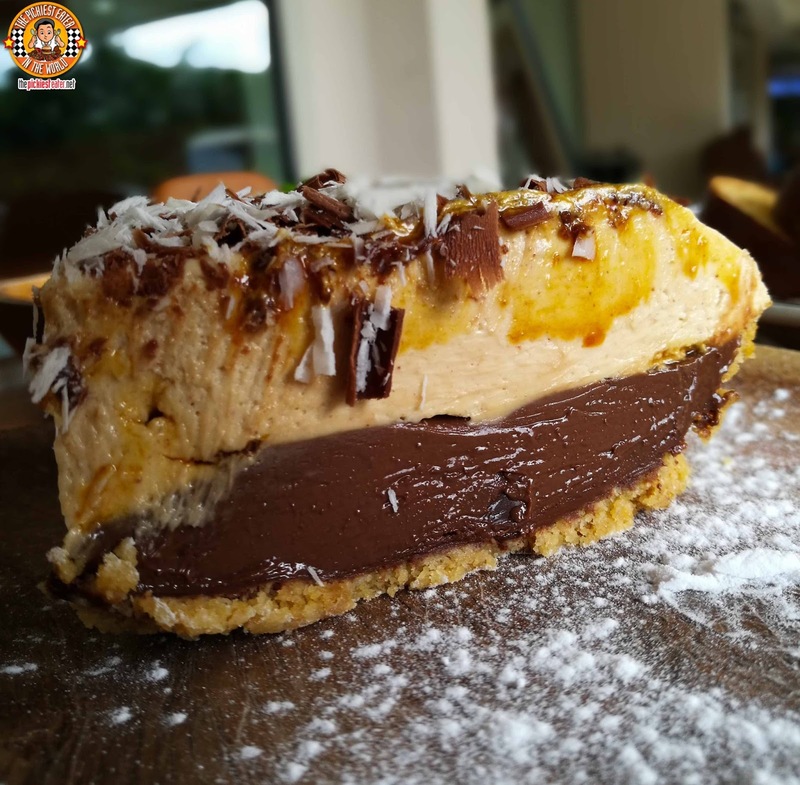 The Honey Comb Peanut Butter Pie is just one of the many pies from Pi Breakfast and Pies that you must not miss. Also the selection of breads and other baked goods will leave you with loads of take home boxes. You've been promptly warned. If there was a restaurant that was out of my way and I wished would have a branch nearer to me, Pi Breakfast and Pies would be up there on that list, which is why the branch in The Grove by Rockwell was like a gift from the heavens for me. 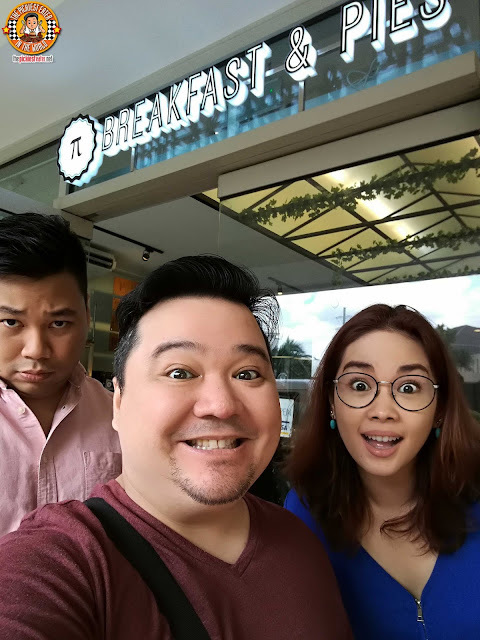 If you're like me and you love you so breakfast food, You'll be surprised how this little restaurant that could, can stand toe to toe with the big name breakfast restaurant chains out there,, and it's proudly pinoy! Like Pi Breakfast and Pies on facebook! SAY YASS TO CHOCO MUCHO, WITH YASSI PRESSMAN!